Heather & Peter adore France and have a house in the Burgundy region. They talk so passionately about the country and especially about the food and wine. They are also both keen skiers and go every year as regular as clock work to Val Thorens, staying at the same hotel and even the same room! They were always singing the praises of the hotel saying the management and owner of the hotel were extremely friendly and the food was spectacular. It was like “home from home” with the added benefit of being to ski in and ski from the hotel. It sounded so inviting that I just had to give it a go! In the weeks running up of the holiday I was determined to get fit. I had convinced myself that I was going to be able to ski well by the end of the week. Friends had told me that skiing was extremely hard on the legs but, being a competitive person, I was not going to be defeated by the ski slopes. But whilst my aim was to be in peak condition my main concern wasn’t for me but for Barry He was overweight with a bad back and painful shoulder; he wasn’t fit at all! I was worried that, even though he could ski, he hadn’t done so for many years and I didn’t feel he was up to it. The last thing we needed was for him to have an accident and be incapacitated. We decided to drive to our destination breaking the journey by stopping and spending a night at a beautiful hotel called Le Cep. It’s in Beaune in the heart of the Burgundy wine region. The food and wine was exceptional. Burgundy is my favourite wine of all and this overnight stop was the perfect start to the holiday. We set off fairly early the next day heading for the Alps. Val Thorens is the highest ski resort in France and the journey seemed endless. It is so high that the village is above the tree line. 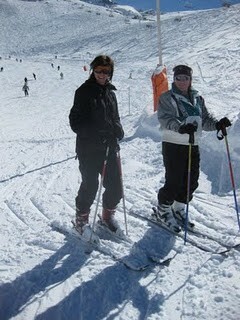 That seemed to me to be an advantage….. no trees on the slopes meant less obstacles for me to negotiate around! When we finally reached the village I was taken back by the sheer beauty of the snow and, to my delight, it wasn’t even cold. I couldn’t wait to try my hand at skiing. I was advised to go into ski school for the first few days until I’d learnt the basics and then advance to a personal ski instructor. I was doing so well and I didn’t fall over for the first couple of days but, OMG didn’t my legs hurt! I found muscles that I didn’t know I had. It also took me a couple of days to acclimatize to the altitude but I loved my first experience at skiing. I couldn’t wait to get a little higher on the slopes and become more competent so that I could meet up with the rest of the gang for lunch at one of the restaurants in the mountains. My goal was that by the Saturday, our last day of skiing, I would have progressed enough to ski with Barry and our friends. We agreed we would spend the morning skiing and then have a well deserved lunch at one of their favourite haunts. Whilst we were having dinner on the Thursday night the owner of the hotel came over to our table to talk and ask how we were enjoying our holiday; he looked straight at me and said he understood that I’d had a bad skiing accident and I’d hurt my leg. I looked at him horrified and said you’ve got the wrong person but he again insisted that it was me. “No” I said again emphatically, he looked puzzled and, at the same time, pleased that I had not hurt myself and then went on his way. I didn’t realise at the time a warning was been given to me but it was to subtle; the penny didn’t drop, especially after we’d had a couple of bottles of wine and I didn’t give it another thought. Over that night we had a good dump of snow; everyone was excited and couldn’t wait to get out onto the slopes the next morning. I had a long relaxing breakfast as my lesson wasn’t until 1pm. But just as I was leaving our hotel room to get my skis Simeon, my spiritual guide told me to take my mobile with me which was something I didn’t normally do for fear of breaking it if I fell. However, I did what he said and didn’t question as time wasn’t on my side. My ski Instructor seemed very impressed with my progress and perhaps thought I was better than I actually was. After trying a few of the lower slopes he suggested we went higher. Even though I felt a bit nervous going higher than I had gone before I was encouraged to think that my instructor felt I was capable. When I got off of the chair lift and saw the steep drop my heart nearly stopped, sheer panic came over me, I instantly knew I was way out of my depth. The ski instructor calmed me down and said that I had to trust him, that we were going to do it slowly and that we were not skiing straight down, but we were going to practise my turns going from side to side down the mountain, which would be less daunting and dangerous for me as a novice. I took him at his word and just wanted the whole experience of that day to be over, I now hated every move that I made. I felt very much out of control. All of a sudden I hit a big mound of snow; my skis ploughed into the middle; my body moved right and my left leg went left. I heard and felt a pop and knew instantly that I had done some serious damage. The pain was immense and I couldn’t stand up. “Had I broken my leg”, I thought. My knee kept moving and felt out of joint. It gave me no support and couldn’t stand or walk. Skiing down the slope now was out of the question. My instructor and I both sat on the mountain waiting for the recovery sledge, “the meat wagon”, to pick me up and take me off the mountain to the local hospital. I just sat and prayed that I’d be alright. At that moment I realised why Simeon had told me to take my phone with me. I telephoned Barry and told him my plight but not for him to worry and to carry on skiing and to meet me at the hospital later. Being strapped up on the sledge going down the slopes was the most frightening experience that I’d ever had. It was so bumpy and uncomfortable; I cried the whole way down but, thankfully, nobody could see me. The journey seemed endless, I became worried and started to think the worst, I’ve got such a good imagination; it runs riot. All of a sudden I felt comforted and a warm feeling of spirit came all over me. My mum made her presence known which made me feel even more emotional. “God” I thought, “has she come to get me”? “Am I that bad”? She laughed at my silly thoughts and said, “You’ll be fine; you haven’t broken any bones”. When you’re not feeling well the only person in the world you want is your mum. She came in my hour of need, to the rescue, as she always did. She stayed with me all the way whilst I was on my own going down the mountain it felt so special having my mother again with me. I just wanted to tell everyone, but I thought they might think I was a little mad, so I decided against it, especially as I didn’t want them to think that I’d got serious head injuries!!!! I couldn’t believe how mercenary the hospitals in the mountains can be. All they are interested in is how they are going to get paid. The patient’s wellbeing comes second priority to them. They wouldn’t even take a credit card; it had to be cash. They were literally wheeling patients to cash machines to make sure they got paid. It made me realise just how lucky we are in England for the NHS and how we should appreciate it more and not take it for granted. When I returned home I read through my hospital notes, only to find that they had given me notes that related to someone else! It demonstrated that the hospital was not only expensive but also incompetent! Shortly afterwards I went to see a surgeon who sent me for an MRI scan so that the exact diagnosis could be made. The scanning process was somewhat long-winded and my mind started to wander. Somewhat morbidly I started to think about people’s experiences when they’ve clinically died on the operating table but were then brought back to life. There have been a number of clinical trials carried out in Southampton where they placed shapes, colours and numbers in the operating theatre to see whether they could be seen during a near death or out-of-body experience. Many patients reported back positively what they had seen during their near death experiences. Here was my opportunity to experiment and have an out-of-body experience often know as “astral travelling”. This simply means the soul, or etheric body withdraws from the physical body. Some mediums can do this at will but, although I had always been fascinated, I’d never tried it. I laid still, gently breathing and fixing my concentration to one spot on the ceiling. Projecting my etheric spiritual body out into the scanning room to see what I could pick up looking down from a different perspective. A few minutes into my deep concentration the radiographer spoke over the loud speaker to say that “we’ve got movement on the scan we’ll have to do it again”. Her voice shocked me, I felt a sudden jolt I’d obviously had a result but she’d interrupted my experiment. The scan had detected my etheric body slowly moving. “How exciting is that”? I thought!!!! I was later informed by my surgeon Professor David Barrett that I required reconstructive surgery. The operation involves replacing the torn anterior cruciate ligament of the knee with a graft. The graft would be taken from my hamstring. I was asked if I’d prefer the graft from a donor rather than going through the additional pain of using my own. My immediate response was to say “NO”, being a sensitive I could end up having all sorts of emotional feelings and flash backs from the donor which I didn’t want. So I opted for my hamstring to be grafted, irrespective of the pain that I had to go through, I’d heard and been aware of lots of incidents where people had taken donor organs and they had overwhelming feelings from the donor. The utter thought of that sent shivers down my spine. I was fortunate that I wasn’t in a life or death situation where that would have been my only choice. The operation was scheduled for Tuesday 3rd of May which happened to fall on the same day as my beloved dog Zimba’s 5th birthday. Sadly he is now with spirit. That date seemed so long away and wouldn’t give me enough recovery time in order for me to fulfil an evening of clairvoyance for charity on 6th May. I asked the consultant’s secretary if there was any chance of bringing the operation forward but, regrettably, he was fully booked. However, she did put me on the stand-by list in case of a cancellation. I prayed and told spirit that I needed to go in for the op much sooner than had been scheduled. I put my faith in God and spirit and I knew they’d come up with an alternative date, so I didn’t cancel my appearance on stage for my evening of clairvoyance. I just kept seeing myself having the operation much earlier and doing the demonstration. Just as I was losing hope and thinking that I needed to let the organisers know that I wouldn’t be available, my mobile rang and it was the consultant’s secretary advising me that they’d had a cancellation for Tuesday 24th April and was that convenient for me. Her timing was perfect and stopped me in my tracks from cancelling my demonstration. Spirit never fails. I felt bad for my moment of hesitation and doubt but as normal they came up trumps. Whilst in hospital I had the sense that some of the nurses were wary of me, and others were just acted professionally, as you would expect. I realised that they had found out my profession and some were waiting for me to perform with some kind of message. There was also a tension amongst the staff. One particular nurse came into check my blood pressure and asked if I wanted more pain relief, she told me that she’d seen on my notes that I was a medium and did I mind talking to her. I could tell that the tension on the ward was aimed towards this nurse. Her grandmother came in very close and told her that even though she was disappointed in not getting the job as a matron she was about to be moved to a different department where she would fit in and the work would be more inline with her skills. I could tell her strengths were in trauma; she would be at her best in times of crisis keeping her head when others would panic. She was going onto better things but couldn’t see that at this moment. She enjoyed research and had excellent knowledge of drugs which would be put to good use in this move. I told her to trust in fate and know that her grandmother was looking after her. She would have the job she dreamt of but it wasn’t on this ward. She was needed elsewhere and her pathway to service was helping those in critical condition. I told her that spirit often guided her through her thoughts when she had to make life saving decisions along with the team of nurses she worked with. I’m sure that the surgeons and nurses are not aware that they have a band of spirit working closely to them helping, guiding and assisting them to help those in need; leading them to discover new breakthroughs in surgery and life saving drugs. Where does that flash of inspiration come from? I know man has a little help from those above! The healing process has seemed to take for ever and this is made worse by the fact that I’m impatient, added to which its terribly painful walking up the stairs. In fact, the pain is excruciating and I walk up the stairs as if I’m 90! The pain seems to be coming from one particular spot where the incision was made and I made the assumption that maybe a screw had become loose. The physio assured me that I was making good progress and that the pain would reduce as the knee healed. When I returned home Barry asked how I got on and I said “I haven’t got a screw loose”! To which we both roared with laughter and he then replied, “I’m so glad I’m not sleeping with a nutter”!!!!!! I must allow time for the healing process to take its course. Spirit has told me to slow down and take time out and I was being made to rest, whether I liked it or not. Who am I to argue with the spirit world?